Each day I look forward to preparing a big pitcher of cold-pressed juice. I love the way the juicer gently presses the fruits, vegetables, and greens into a delicious vitamin and enzyme-rich delight. 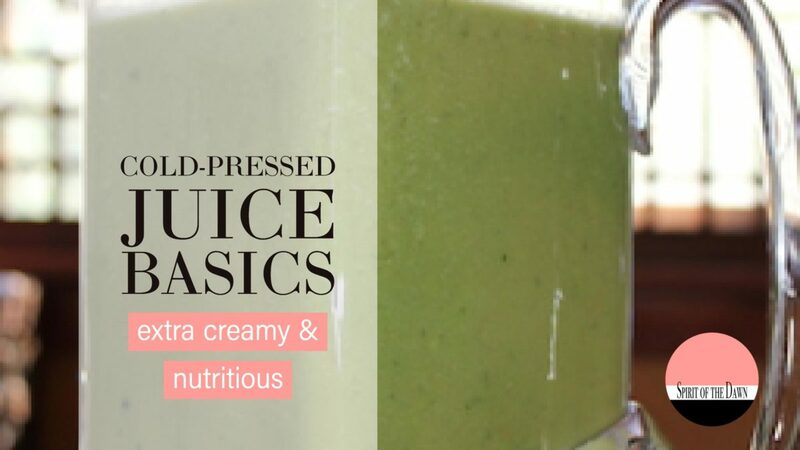 Today I'll share a basic recipe to use with a cold-press or slow juicer including the secret ingredient I add to my juice to make it extra-creamy and nutritious. It’s late summer here in Southern Oregon and the ingredients used in this basic juice recipe are inspired by what is growing in our garden and what the local farms are producing. The new crop of apples have just come in and our garden is yielding an abundance of cucumbers, parsley, and carrots. I’ve thoroughly enjoyed the summer bounty of Reed Avocados that I can still find at the local co-op coming up from California along with lemons and limes. The resulting juice has some pulp which I prefer, though it can be strained further to filter out all pulp. Cold-press juicers, also known as slow juicers, allow for a gentle blending of ingredients before the juice pours into the waiting container and my secret of adding avocado creates a creaminess and a melding of flavors. The really important part about adding the avocado is the healthy fat it contains for the fat itself and also to facilitate the absorption of Vitamin A and balance the sugars so I don’t get a sugar high and then a low. I enjoy having cold-pressed juice at any time of day including for a light dinner. A dinner of juice sustains me and gives me energy all evening and through the night. I wake in the morning feeling radiant and eager to start the day! Prepare the following vegetables, fruits, and greens and place in a large bowl or on a cutting board. I like to alternate ingredients as I add them to the juicer and having everything ready makes the actual juicing go quickly and easily. Wash everything really well before beginning the cutting and peeling process. I use a special cleanser that helps remove mold, dirt, and insects from the bounty of organic produce. I save all of the trimmings, except for the citrus and the avocado peel, to feed to our chickens! Please keep in mind that chickens don’t do well trying to digest the pulp from juicing and the cute worms in the worm bin can’t eat citrus, either. This recipe was creating using the Huron Slow Juicer. Your juicer may work slightly differently. Make any adjustments to these instructions that you need to accommodate how your juicer operates. With the Juice Cap closed and the Pulp Control Lever set to Open, using the fine meshed strainer, add one piece of prepared produce and then turn the motor on. Begin adding the cut up fruit and vegetables alternating between soft and firm and leafy. When the juicer is full, open the Juice Cap and let the juice pour into the juicer pitcher. Close the Juice Cap back up and continue to juice and blend the remaining ingredients. Add those also to the pitcher. If you would like to remove even more pulp, strain the juice into a serving pitcher or glasses. Some of the newer cold-pressed juicers come with an optional strainer attachment. I enjoy the pulp and often just stir with a whisk to blend all of the juice and remove excess pulp. Enjoy playing with this recipe and experimenting with what the season offers you!